Heres a superb new online slots game. The Link is an online slots game by developer Gamevy. It is rather basic and straightforward which makes it ideal for novice online slots players. 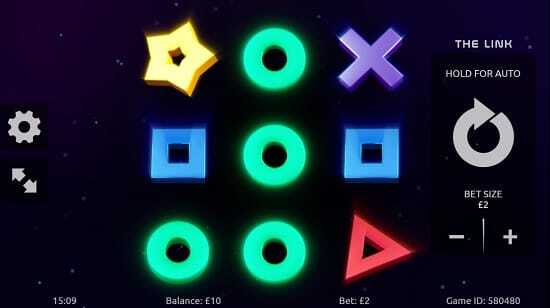 The online slots game uses shapes and colours to differentiate its symbols, with the Diamond giving sparklingly high returns. It also has a Wild feature that makes an appearance from time to time. The Link has 3 reels and 8 pay lines. This recent slot games comes with a betting range of £1 to £10. Gamevy was founded in 2013 and they are soon starting to create a name for real-money games – lotteries, slots, scratch cards, bingo, etc. For a 15 people operation, they have grown significantly over the years with their very own team of international developers who design the games and translate them to various languages such as German, Chinese, Turkish, etc. If you love promo's, get the top casino promotions today. The Link has a simple presentation of a starry night sky that is littered with colourful shapes. The clean appearance is easy to the eyes and allows gamers to focus on landing winning combinations. 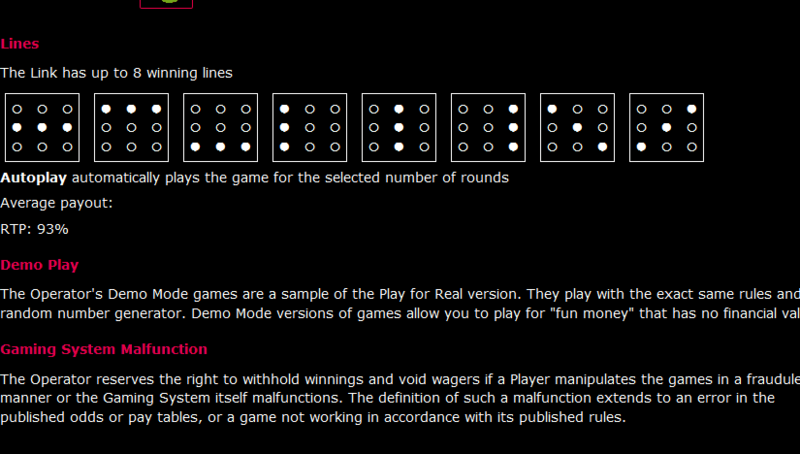 The Link has 8 pay lines in which players can form winning combinations across the 3 reels. The circle and cross symbols are the lowest paying, and triangle and squares are slightly higher value symbols. The highest value symbols, however, are the diamonds. Like all slot games, the key is to land winning combinations that consist of identical symbols appearing in a row in threes or more. In The Link, this is no different. There is a bonus though, the winning combinations can be formed in 8 different ways: left to right, down to up, and even diagonally. The Star represents the Wild Symbol in this game. And unlike all other Wilds, this Wild can replace every single symbol in this online slots game. 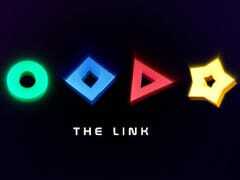 The highest value symbol in The Link is the Diamond. If it appears on the pay line, the returns can be very rewarding. The Link may disappoint classic slots players due to its imbalanced wagering range. There are not many returns for the risk that you’re taking. However, it does offer 8 pay lines and a Wild, which to many is a fair trade-off. If you enjoyed The Link then you might also like Vikings Go Berzerk.